"We had a quick chat where I got to know he was an M.Com graduate from Calcutta University and also done PGDM in Finance or Investment banking or something similar." A post on the need to create more jobs has gone viral online. A Kolkata college student's hard-hitting post on the need to create more jobs has gone viral online. 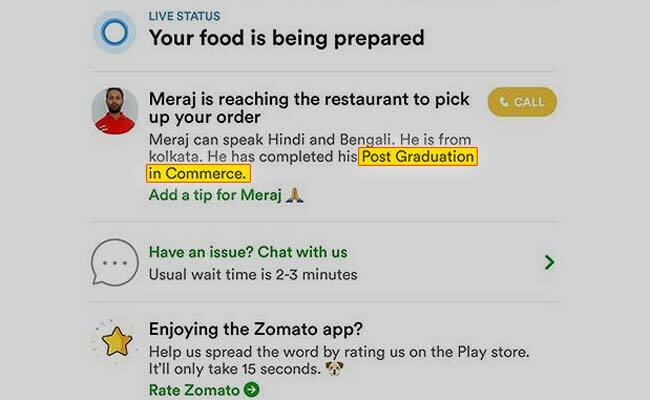 "Probably the only time I regret ordering food from Zomato," wrote Shouvik Dutta on Facebook after discovering that his meal was delivered to him by a man who had a postgraduate degree in commerce. Shouvik says in his post that he was taken aback to see that Meraj, who was delivering his food order, was a postgraduate in commerce. He also recalls what he calls the "most embarrassing" moment of his life - when Meraj delivered his order and asked for a good rating. "We had a quick chat where I got to know he was an M.Com graduate from Calcutta University and also done PGDM in Finance or Investment banking or something similar," wrote Shouvik. He then went on to comment on the irony of a postgraduate man delivering food to a "regular undergraduate teenager". This country needs to change," he concluded. His post has gone viral with over 2,500 reactions and as many 'shares'. "Meraj is working hard, learning basics, he will succeed... Definitely," wrote one commenter. "Whole system need to change," another said.